This section is important because sub-section (a) specifically waives sovereign immunity. You may already know that you cannot sue a state because state’s have sovereign immunity from suit. One exception to this is when the state allows itself to be sued by waiving sovereign immunity under certain circumstances. In this case, the state of Texas has waived sovereign immunity under this chapter allowing you to sue state agencies subject to the requirement in section 110.006 of providing the state agency an opportunity to remedy the burden. Immunity is also limited to the relief enumerated in section 110.005. Sub-section (a) also specifically states that you can sue a government agency for damages specified in section 110.005. In a previous section, it was stated that you cannot sue individuals except in their official capacity, which means suing the state. This section explicitly authorizes suing a state agency, which is suing the state. This is important because sovereign immunity prohibits suit for damages where payment would come from the state treasury, even indirectly in some cases unless the state, as it did here, specifically allows it. Sub-section (b) further limits the waiver of sovereign immunity to suit in state courts only. You are prevented from suing the state directly in federal court, in many cases, by sovereign immunity as protected under the Eleventh Amendment to the United States Constitution. There are two elements to sovereign immunity. One is immunity from suit, where the state can’t even be made to participate in a suit. The other is immunity from damages that would be paid from the state treasury. This sub-section makes clear that the state is not waiving either of these forms of immunity as they would apply in a federal court. Subsequent posts on this topic will continue to explain the power of this statute and how it applies to parents in SAPCR proceedings. You will also find that we have created a package of training and assistance with educating you on how we might have used this in our case. Soon you will learn that using this statute you may get your attorney’s fees and costs paid for by the state of Texas. 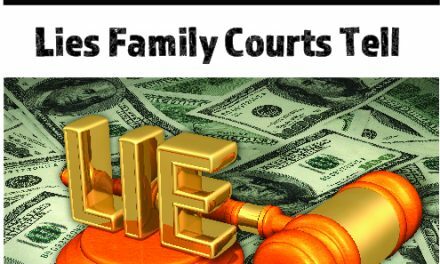 You may even get compensatory damages for the harm the court did to you and your child up to a maximum of $10,000. 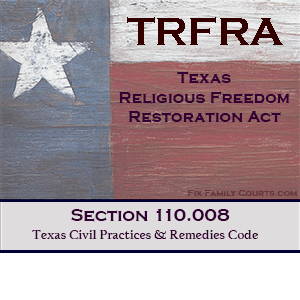 So, keep reading and when you have completed the free materials, inquire about the FFC Texas Religious Freedom Package (TRFRA) that provides tools and shortcuts that you and your attorney can use to win your equal rights to your children and to avoid costly mistakes that could prevent you from receiving the protection of this statute. Sec. 110.008. Sovereign Immunity Waived. (a) Subject to Section 110.006, sovereign immunity to suit and from liability is waived and abolished to the extent of liability created by Section 110.005, and a claimant may sue a government agency for damages allowed by that section. (b) Notwithstanding Subsection (a), this chapter does not waive or abolish sovereign immunity to suit and from liability under the Eleventh Amendment to the United States Constitution.